Local farms may be a safer solution as well as researching what treatments they administer, or feed to animals. There are endless lists and material advising what fruit and vegetables are particularly contaminated, and they are often contradictory depending on the source. �The best recommendation for fruit is to buy fruits with the skin on and peel it before consuming (i.e. bananas, tangerines, oranges, mango, kiwi, papaya, melon, etc.). An exception however is for apples, which are currently on the black list for being the most contaminated. However, my top tip is to clean fruit with the skin before eating with salt and water. The salt removes the pesticides. If we consume them raw (e.g. 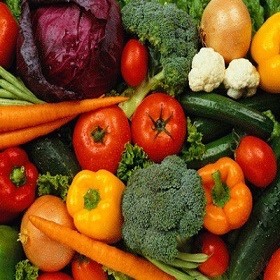 peppers, lettuce, tomatoes, spinach etc,) I would also recommend washing them with salt and water. Vegetables like courgette, potatoes, broccoli, cauliflower, asparagus, mushrooms, washing them with water and blanch/cook them is another efficient way to remove residue.